Apples and cheese. One of my favorite combinations! 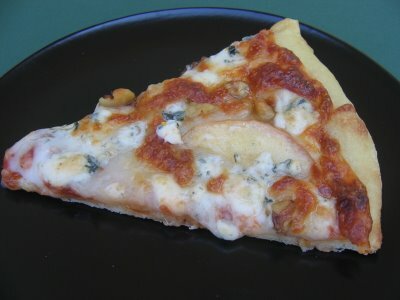 Here, the classic pear is replaced with apple to make an Apple and Gorgonzola Pizza. I made a standard cheese pizza with pizza dough, pizza sauce and grated mozzarella and added thin slices of apple, a generous amount of crumbly Gorgonzola, and walnut pieces. 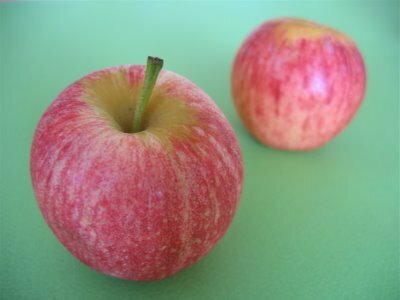 I loved the subtle sweetness and crunch of the apple. 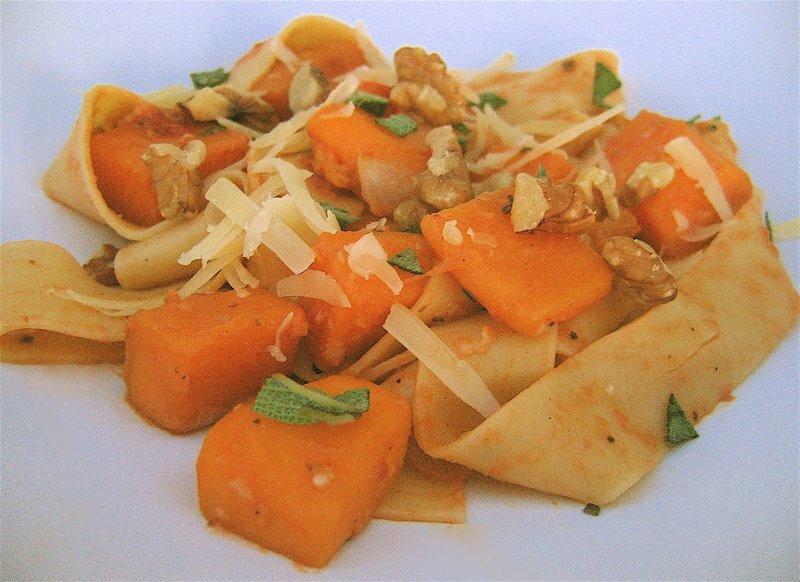 Thick ribbons of pappardelle with butternut squash in a super light tomato-cream sauce with fresh sage, topped with walnuts and Parrano cheese made a substantial dish perfect for the beginning of fall and cooler weather. I love the cheerful look of this dish with the bright orange squash and the rich green sage. For the sauce, I used a combination of vegetable stock, half & half, vermouth, and red pasta sauce and it was absolutely wonderful - not heavy at all, but full of flavor. It complimented the squash nicely without covering up its own fresh taste. The cheese, Parrano, is a Dutch cheese that tastes like an Italian cheese. It has the smooth texture of Gouda, but tastes nutty, salty, and rather like Parmesan. Try this on gratins - it melts well. While you have to be careful using fresh sage due to its strong astringent taste, I wish I had used more in this recipe. It's minty and sharp woodsy taste really made this dish special. Steam the squash until it's almost cooked through, but still retains a little crunch. Cook the Pappardelle per instructions - do not overcook. While pasta is cooking, melt the butter in a skillet and add the onion. Cook over med heat until softened. Add the garlic and cook 1 minute. Add the squash, along with the vegetable broth and cook gently for 4 minutes. Add the vermouth, half & half, and pasta sauce and stir well. Add most of the sage, saving some to top the dish. Add the cooked pasta and season to taste. Cook for 2-3 minutes then serve topped with walnut pieces, grated Parrano, and reserved sage. Not to Be Missed : It's Fall! Fall is here and, despite the little heat wave we've been experiencing here, I'm already thinking pumpkins, apples, pies, and gratins! From Susan at Fatfree Vegan, don't miss these awesome potato pizzas and this stunning Southwestern Yellow Split Pea Soup with red jalapenos (I'm so there!). Alanna at Veggie Venture is in a gratin mood, check out her Swiss Chard Gratin and be sure to follow her other gratin links at the bottom of this post. Yum! Right now, I could really go for one of these healthy vegetarian Sweet Potato & Cheddar Burritos with BBQ sauce on Judy's Pages. And, for those of you who are ready for a heartier breakfast, don't miss Sam's mouthwatering Donna Hay Inspired English Breakfast Tart. 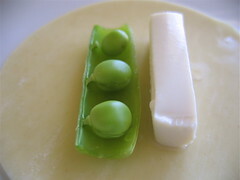 I think this is the cutest tart ever! Another fabulous recipe from The Real Food Daily Cookbook , this Sweet and Sour Tempeh was a huge success! The tempeh is marinated with tamari, oil, and lots of garlic and ginger, then grilled under the broiler. The vegetables — onions, carrots, peppers, cabbage, and corn — are sauted in sesame oil and then the everything is brought together with the sweet and sour sauce. I love that the marinade becomes the basis for the sweet and sour sauce. I wouldn't have thought to use corn, but is worked beautifully. I served this with white rice, which I combined with chopped cilantro and peanuts per the recipe's recommendation - sensational. As this recipe is chock full of healthy veggies and high-protein tempeh, this is my contribution to this week's Sweetnicks ARF/5-A-Day Tuesday (ARF=Antioxidant Rich Food). Slice the tempeh horizontally (so its half its original thickness) and then cut each piece in half diagonally (you should end up with 4 triangles). Mix together the marinade ingredients and marinade the tempeh for 1 hour at room temperature. Turn on the broiler and broil the tempeh on each side for about 5 minutes. Take the left-over marinade and whisk together with the maple syrup, brown rice vinegar, and arrowroot. When the tempeh is cooled, cut it into 1" triangles. In a large skillet, heat the sesame oil and crushed red peppers over med.-high heat. Add the onions and saute for 2 minutes. Add the carrots and sauted another 4 minutes. Add the pepper and sauted 2 minutes. Add the cabbage and corn and saute 2 minutes. Pour in the sauce and cook for 1 minute. Add the tempeh and cook 3-4 minutes, until thick and bubbling. Yves Veggie Pizza Pepperoni with fresh green peppers, marinated portobellos, mozzarella and feta cheeses, and pine nuts made this hearty and succulent pizza. I'd been looking for the Yves Pepperoni for ages with no success. It used to be everywhere (even Safeway carried it) but none of our local stores have it now. That's a shame, because its very good on pizza. Happily, a friend found it at Rainbow in San Francisco and picked me up a pack. I had half a marinated portobello leftover from the Mushroom & Goat Cheese Quesadillas, which made this pizza super succulent and delicious! The green peppers added freshness and bite. I used a base of pizza sauce and grated mozzarella and feta on top. Leftovers make a lovely breakfast! When Pastrygirl of Dessert First posted about her favorite cookie recipe, I just had to try them out! 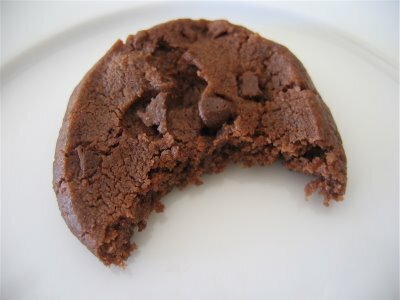 These are truly melt-in-your-mouth chocolate cookies and Pastrygirl's detailed instructions are flawless. I'll be baking these for Thanksgiving and Christmas and any other special occasion I can think of. The original recipe is by Dorie Greenspan, who wrote to Pastrygirl after her fabulous post. 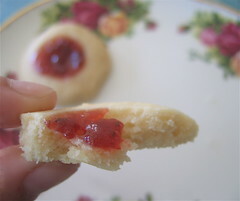 Read all about these World Peace Cookies at Dessert First. And, no eggs, so go ahead and scrape the bowl clean! 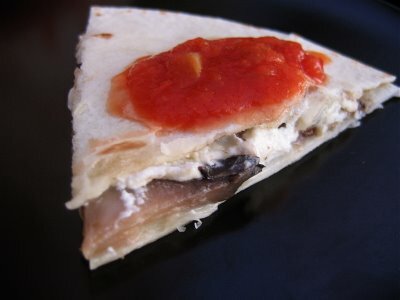 Marinated and grilled portobello mushrooms and goat cheese added sophistication to cheese quesadillas! The ports were marinated in a mixture of olive oil, balsamic vinegar, minced garlic and salt and pepper for 30 minutes, then grilled under the broiler for about 5 minutes each side (mine were huge!). I then turned down the oven to 350. I put a flour tortilla on a baking tray and covered with grated mozzarella. I sliced the grilled ports and laid them on top, then lots of crumbled goat cheese, more mozzarella, and another tortilla. Baked in the oven for 7 minutes and then served in pizza pie wedges with salsa. Yum! These were based on a much more involved recipe in The Whole Foods Market Cookbook . I'm definitely sweet on sweet potato leaves and lucky to have access to them at my local Farmer's Market. 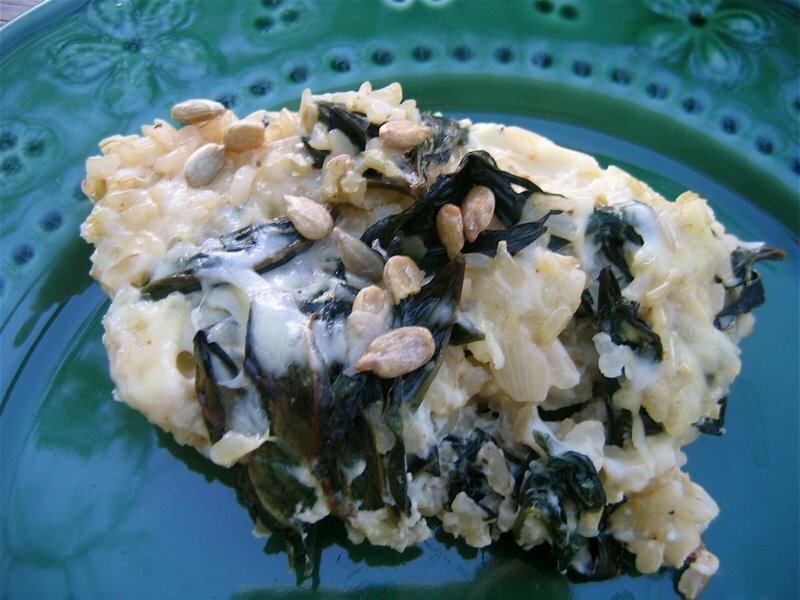 This adaption of Moosewood's Spinach-Rice Casserole substituted the sweet potato leaves for spinach. I reduced the eggs from 4 to 2 and the milk from 1 cup to 1/2 to lighten and reduce the custard. Sweet potato leaves have a slightly nutty flavor, so I used 1/2 cup each of Fontina and Jarlsberg cheeses (vs. 1-1/2 cups grated cheddar), to accentuate the mild nuttiness. I have to say, I much preferred this version to the original. Heat the olive oil in a skillet and saute the onions until softened. Add the garlic and sweet potato leaves and saute for 4 minutes. Remove from heat. Beat together the eggs and milk. Add the cooked rice, egg mixture, and cheese (reserving some cheese for top) to the leaves and stir gently until well combined. Season with salt, pepper, and cayenne pepper (I used several generous shakes of cayenne and loved it!). Spread mixture into a greased casserole dish and top with reserved cheese and sunflower seeds. The recipe and photo of this scrumptious Cheese & Chile Quiche in the September 2006 Gourmet magazine was truly inspiring. I knew it would be fabulous! 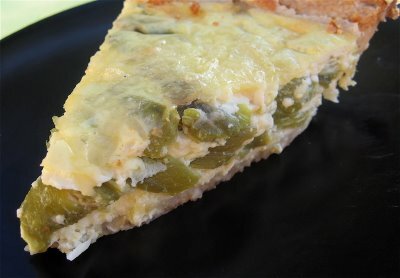 Their photo was looking down on the quiche with a pie piece being removed, so I went for the close-up side view above. (Click on the photo to see this quiche in all its detail!) Packed full of roasted poblano chiles, this quiche melted in the mouth. One clever idea I learned from this recipe was to use raw finely grated onion in the custard! I adapted the original recipe, using two eggs plus one egg yolk instead of the six eggs in their recipe. I used 1-1/8 cups of half & half in place of the cup of milk and 1/2 cup of Mexican crema or heavy cream. I used about a cup of grated Monterey Jack cheese in place of their 2-1/2 to 3 cups. And I used a frozen premade pie crust to save time! Next time I'll use a blend of Monterey Jack and Cheddar cheese to punch up the cheese taste (MJ is so mild) without having to use 3 cups! This is definitely a recipe I'll enjoy again and again. There were several awesome chile recipes in Gourmet's Anniversary Edition, along with many wonderful fall recipes (think apples, potatoes, corn) and lots of vegetarian recipes, so be sure to check it out! Roast the chiles under a grill, turning evenly, until the skins are blackened. Put in a bowl and cover with a plate (or in a plastic bag) and allow to steam for 20 minutes. 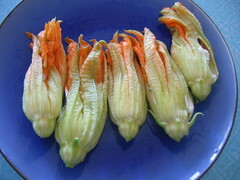 Peel off the skins, remove the stalks, any stringy ribs, and all of the seeds. Cut the chiles into strips about 2-1/2" long and 1/3" wide. Beat the eggs and egg yolk. Beat in the half & half, garlic, onion, salt & pepper. Sprinkle some of the grated cheese on the bottom of the pie crust. Put the pie crust on a baking sheet and pour the custard into pie crust and then add the chiles and cheese, saving a little cheese to add on top, if desired. Bake for about 35 minutes until set. 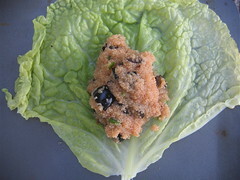 Serve with a tomato and avocado salad or try it with South of the Border Couscous Salad. Steamed pattypan squash is stuffed with a spicy chickpea curry in this healthy vegetable main! Inspired by a recipe for curry-stuffed eggplant and by Alanna's darling stuffed pattypan squash, this dish was attractive and tasty. I followed Alanna's instructions on cutting out the squash, but rather than baking mine with the stuffing, I steamed the squash for around 10 minutes. It had a wonderful fresh texture and was the perfect edible container for the hot curry. Usually, I make cucumber raita to provide that fresh taste to contrast curry, but in this dish the squash neatly takes up that role. 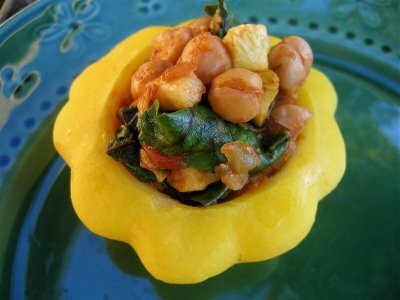 The chickpea curry was a simple affair: chickpeas, chard, and the removed squash, onion, garlic, curry powder, and toasted cumin seeds. This dish is my contribution to this week's Sweetnicks ARF/5-A-Day Tuesday (ARF=Antioxidant Rich Food). Summer squash and chickpeas are excellent sources of manganese, an important mineral that contributes to the body's energy production and antioxidant defenses. Chickpeas are also packed full of protein and iron and excellent sources of fiber. Summer squash is also a good source of Vitamin C. (source:World's Healthiest Foods). We enjoyed this with dal, cilantro chutney, naan, and a little light sour cream. Yum! Steaming in a hot skillet, we have floured and sauted tofu with mushrooms and capers in a rich tomato sauce! Inspired by a recipe for Tofu and Mushroom Piccata from The Vegetarian Meat and Potatoes Cookbook , I traded the lemon for tomato sauce as the main flavor. It was absolutely delicious, the capers really gave it zing! We enjoyed this with chard and rice. Cut the tofu into rectangles. On a plate combine the flour with salt and pepper. Heat the olive oil in a skillet over med. high heat. Dredge the tofu rectangles in the seasoned flour. Saute the tofu for a couple of minutes on each side until light brown. Add the mushrooms and saute for 2-3 minutes. Turn down the heat and add the capers, red wine and cook 2 minutes. Add the tomato sauce and cook gently for 3 more minutes. 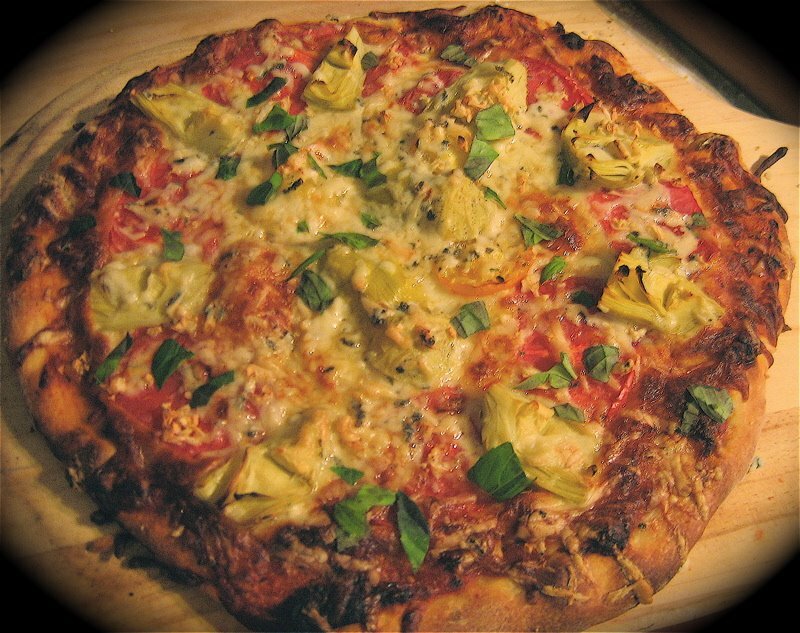 This delicious Blue Moon pizza combines blue cheese, artichokes, tomatoes, and basil to make one heck of a scrumptious delight! 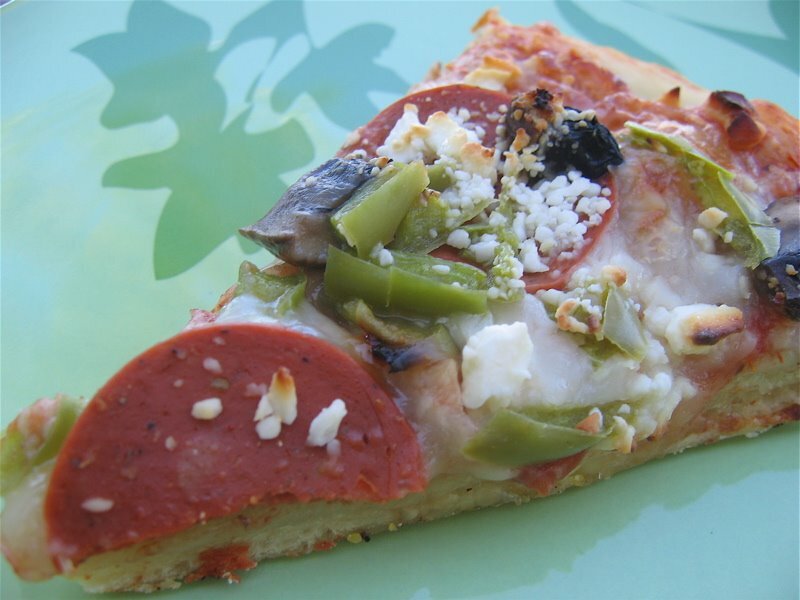 This is a copy of a pizza I found on the Fresh From the Earth menu of Coyote Creek Pizza Co located in the state of Washington. I've never had their pizza, and have no idea how close my copy is, but loved their inventive combination of ingredients. Check out the North by Northwest ingredients - yum! Obviously, these guys are big Gorgonzola fans and I'm with them. I used a Trader Joe's plain pizza dough, pizza sauce, and grated mozarella as a base. Topped with crumbled Gorgonzola , artichokes hearts, and fresh slices of tomato. The original calls for walnuts too, but I skipped them. I add torn basil from the garden after baking for 12 minutes at 450.
p.s. Apologies for the poor photo quality. I'm back on a dial-up modem for the weekend and can't seem to upload to flickr. If you love Mexican flavors and couscous, you'll love this tasty South of the Border Couscous Salad! 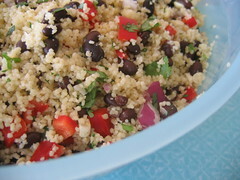 Couscous is combined with black beans, onions, red peppers, corn, cilantro, jalapeno, garlic and lime juice for a hearty salad. 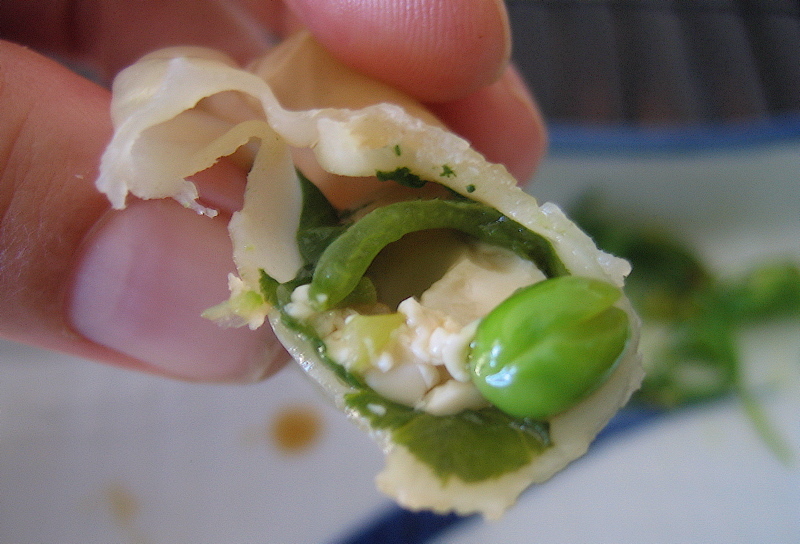 A great potluck dish and super easy to make! 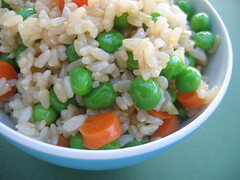 The original recipe was in the September 2006 Vegetarian Times in their One-Dish Dinners section. There was also a recipe for Greek Rice Salad that I'll be making before it gets too chilly. 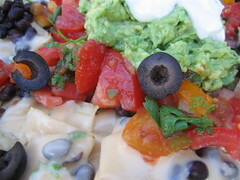 We loved this recipe - a nice take on our favorite Mexican black beans! I adapted the recipe slightly adding a red pepper and increasing the cilantro. The original recipe called for roasted garlic-flavored olive oil which I didn't have, so I used a minced clove of fresh garlic blended in with the salt and extra virgin olive oil. Cook the couscous per package directions. Add the cumin, black beans, and chipped vegetables and herbs. Whisk together the dressing ingredients and pour over couscous. Stir gently until the dressing is well distributed. These vegetarian sausage rolls made with Gimme Lean Sausage and puff pastry were outstanding! I've wanted to try making a veggie version of this English classic for a while now, but had no idea they'd be this good. Hubby had four and said he could have eaten four more (and he's not a vegetarian). My vegan friends also loved them. 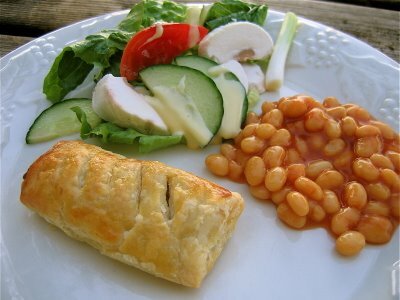 I initially thought I'd cook up some preformed veggie sausages and wrap them in pastry. 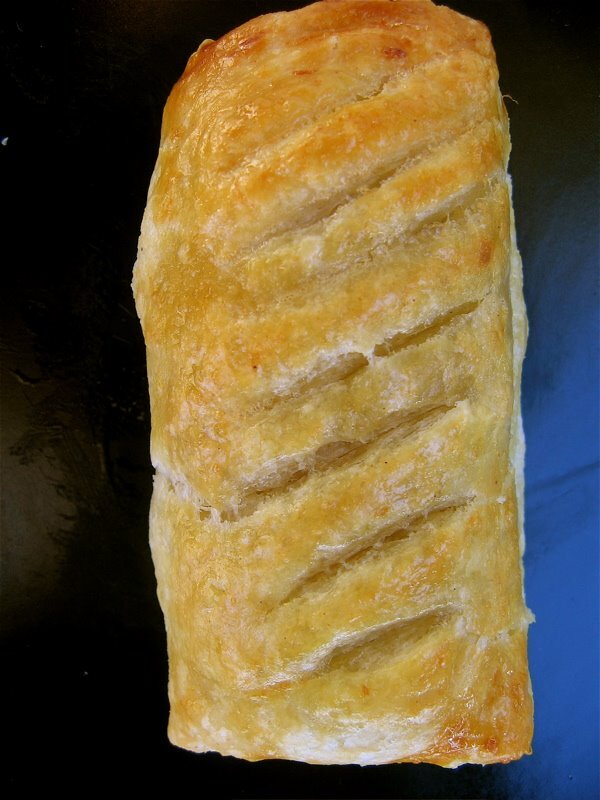 But English sausage rolls are actually very soft, not typically a solid formed sausage. I reviewed my mum's old Good Housekeeping Cooking Compedium (the cookbook I grew up with) and, sure enough, the recipe called for loose sausage meat formed into sausage-like shapes by hand with a little flour. 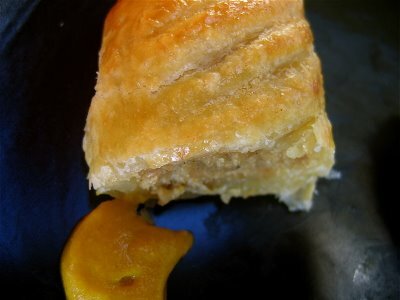 That little epiphany was what made these sausage rolls great! Gimme Lean Sausage was the perfect product to use for these (and, to be honest, I very rarely use it). I used defrosted premade Puff Pastry (Pepperidge Farms, I think). All you do is form small sausages out of the Gimme Lean Sausage with a little flour, wrap the sausages in a rectangle of puff pastry (sealing all the sides with your fingers), score the top with diagonal lines, and brush with beaten egg for that brown, shiny look (optional, but very nice if you're not vegan). Bake on a greased tray at 400 for 10-15 minutes (mine were about 4" long and took 15 minutes). The sausage rolls must be served with Coleman's English mustard, a hot mustard that is absolutely perfect with these. I made a meal of these with Heinz Baked Beans and salad with English Salad Cream. p.s. I'm finally back up on DSL and getting email. My email was lost in the ether for about 10 days, so, if you emailed me and I didn't respond, please resend. Cheers! Wow! This was my first tempeh dish and, boy, was it delicious! 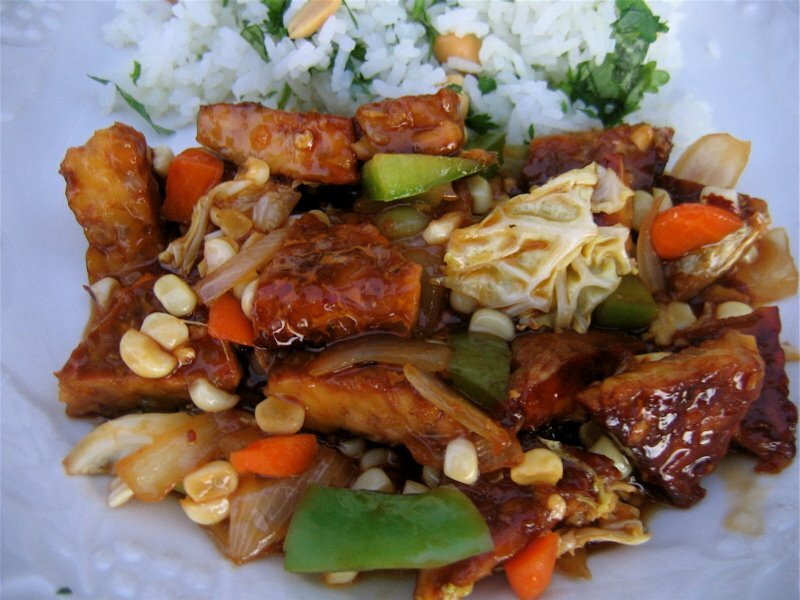 The tempeh is baked with a soy sauce-ginger marinade and then coated in cornmeal and fried. We enjoyed this with steamed broccoli and sweet potato fries (Alexa brand). The recipe came from The Candle Cafe Cookbook, a cookbook that I've heard has some problems with measures although both the recipes I've tried so far have been great. It was a tad salty so I might add vinegar to the marinate, and I did change the cornmeal spices, but I was pleasantly surprised at how tasty, meaty-textured, and filling this was. It's a counterintuitive combination of Asian flavors (soy, ginger) and European herbs, but it works. Hubby noted that the tempeh was "very dense", but he ate the lot and then was eyeing mine. This was probably enough for 3-4 people. I only had medium ground corn meal (the recipe calls for fine ground), but it really came out a treat. Tempeh is made from fermented soybeans and is an excellent source of manganese, protein, copper, and Vitamin B2 (riboflavin), so this dish is my contribution to this week's Sweetnicks ARF/5-A-Day Tuesday (ARF=Antioxidant Rich Food). Preheat your oven to 350. Whisk together the marinade ingredients. Cut the tempeh into 1-2 inch rectangles and place in a baking dish. Pour the marinade over the tempeh and turn the tempeh until each side is covered. Bake for 15 minutes. Turn the tempeh (so the other side is resting in the marinade) and bake for 15 minutes more. (The original recipe called for 1 hour of baking, but all the marinade had been absorbed in 30 minutes so I removed mine). Cornmeal crust ingredients and spread out on a plate. When the tempeh has cooled enough to work with, roll each piece in the cornmeal mixture until all sides are covered. Heat oil in a non-stick skillet until hot but not smoking. Fry the tempeh until crisp and crown, turning frequently (2-4 mins). 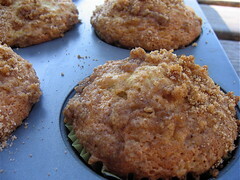 These fluffy banana muffins with a brown sugar and cinnamon crumb topping, are really scrumptious! The recipe calls for three bananas, so they have lots of banana taste. And who doesn't love crumb topping? Now the kids are back at school, I'm looking for new and exciting lunch box items and these were a winner (and they used up my 3 overripe bananas)! But you don't have to be a kid to love these. I followed this recipe from All recipes. com. I added a handful of raisins. Lovely! 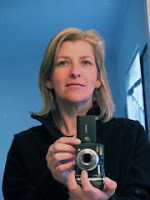 Please help me decide which August photo to submit for" Does My Blog Look Good in This?" by voting (leave a comment) for your favorite photo from the group below. All the photos are on Flickr, so you can click through to see larger versions. This month, Katharine from ToastPoint is hosting. Photos are judged based on eatability, originality, and aesthetics. 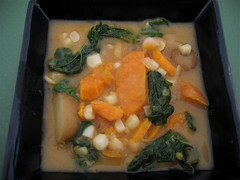 This delicious soup of sweet potatoes, watercress, carrots, beans, corn, and coconut milk made a sweet and satisfying lunch for me and Sweetpea (age 6). Inspired by the drizzly and windy weather, I'll definitely be sending this "hot lunch" into school because its such an appealing and healthy soup for kids. I'd have used a lot more jalapeno if it had been just for me, but I loved it too! This soup was also inspired by Karina's beautiful Purple Cabbage & Sweet Potato (combining sweet potatoes, beans, and coconut milk) and by a recipe from The Candle Cafe Cookbook for Sweet Potato & Watercress Soup (which gave me the idea to combine these two ingredients). Heat the olive oil in a pan and fry the onion for about 5 minutes. Add the sweet potato, carrots, and potato and cover. Cook for about 6 minutes, stirring 2-3 times. Add the vegetable stock/water, jalapeno, beans, and cumin. Bring to a boil then turn down to a simmer. Add the tomato paste. Simmer for 15 minutes and add the coconut milk, corn, and torn cabbage. Cook 5 more minutes and remove from heat. Add the watercress and stir gently. The watercress will wilt. Check seasonings and serve. p.s. Our DSL has been down for a week now, which means my email is also down. I'm using Flickr to upload photos right now. They're small but you can click on them to see a larger version. 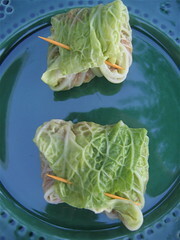 I love the steam cabbage leaf wrap idea of these Inca Parcels, but, sadly, they ended up in the garbage uneaten. That's a rarity in our household. I hate to throw away food, but we just couldn't eat these. This recipe from Vegan by Tony Weston and Yvonne Bishop stuffs steamed cabbage leaves with amaranth a gluten-free grain. But we didn't appreciate the caviar-popping texture of this grain. Texture apart, the sweetness of this stuffing was really unappealing. Balsamic vinegar along with the smoked paprika made this far too sweet and the balsamic vinegar didn't pair well with the olives and jalapeno. A more savory approach would have truly appealed. Next time, I'll stuff my cabbage leaves with couscous with feta and pine nuts and they'll be golden. This marinated and baked Tofu Satay was absolutely delicious! On tiny skewers with cucumber and sweet baby tomatoes and served with a coconut peanut sauce. Can you say yum? The recipe comes from The Candle Cafe Cookbook, a cookbook based on the food served at The Candle Cafe, a vegan restaurant in New York. I had to buy two new vinegars, brown rice vinegar and umeboshi vinegar to make the marinade, but the rest of the ingredients were standards in a veggie kitchen. This recipe is my contribution to this week's Sweetnicks ARF/5-A-Day Tuesday (ARF=Antioxidant Rich Food). Tofu, of course, is high in protein, but its also an excellent source of iron, copper, and manganese. 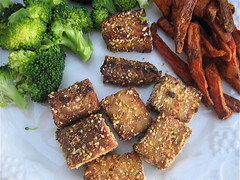 Tofu also contains those important Omega-3 fats and the antioxidant Selenium. Cucumber offers more than a fresh taste; its also a good source of vitamin C and good for your skin. I think this is my favorite tofu so far, and I love the fact that its baked rather than fried. I marinated it for 8 hours in the fridge. There was a separate recipe for the Coconut-Peanut Sauce, but as many of the ingredients were the same as the marinade, I simply mixed the leftover marinade with peanut butter, chopped jalapeno, a little coconut milk and some extra cilantro - it was great! Combine the marinade ingredients in a mini-prep and blend until smooth. 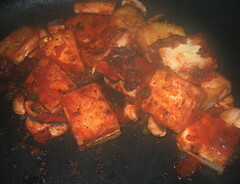 Place the tofu cubes into a tupperware and pour the marinade over the tofu. Put the lid on the tupperware and shake until all the tofu is coated. Put in the fridge, shaking, occasionally for 8 hours (the cookbook recommends 1-24 hours). Preheat the oven to 350. Place the tofu on a baking tray and bake for 10 minutes. Turn the tofu over and bake an additional 8-10 minutes. It should be nicely browned. Remove and allow the tofu to cool. To make the sauce, add the peanut butter, coconut milk, chopped jalapeno, and extra cilantro to the leftover marinade and whisk until well combined. 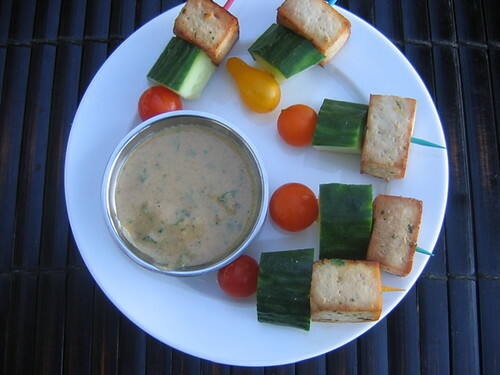 Serve the tofu on a small skewer with a chunk of cucumber and a cherry tomato. Serves 3 as a main along with rice and steamed veggies. 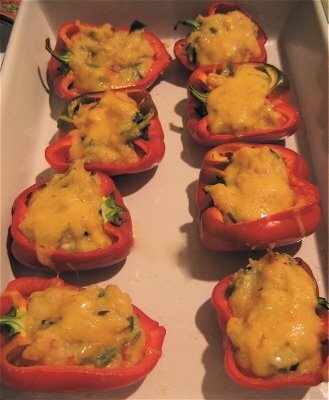 Another tasty and novel recipe from Moosewood's Simple Suppers: Red Peppers Stuffed with Polenta. The original recipe uses Mexican flavors, but as I had an Italian garden vegetable polenta mix, I decided to make it Italian. Next time I'll use plain polenta and fresh vegetables (as called for in the original recipe) as some of the dried "garden vegetables" remained dry through extensive cooking and their vegetable flavor wasn't really up to snuff. That said, I think this is a tasty and attractive way to serve polenta. Slice the peppers from stem to tip and remove the seeds and brush with olive oil. Bake for 10 minutes at 450. Make the polenta and add your own fresh vegetables (parboiled if need be), and 3/4 cup grated cheese. Add the polenta to the peppers, top with cheese, and bake an additional 5-10 minutes. I served these with a salad of red beans, chopped tomatoes, torn basil, and a little fresh mozzarella with oil and balsamic vinegar. This is my new favorite way to eat red beans. Looking for a new take on an old favorite? Check out this colorful and tasty Indian Potato Salad: dry, spicy, and no mayo required! I know from my French Potato Salad post that many of you long for potato salad recipes that don't call for mayo. 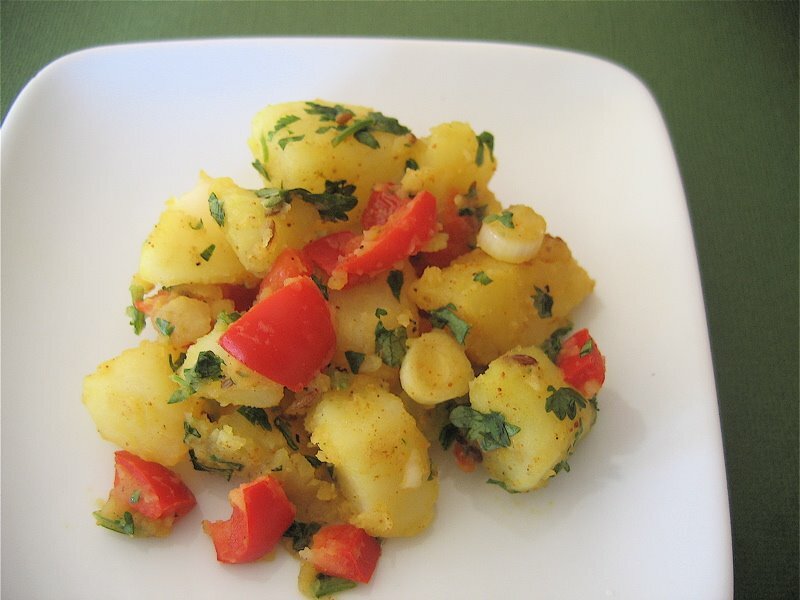 The dryness of this potato salad along with its aromatic spices and sweet red pepper makes it a standout. The recipe is another winner from Moosewood's Simple Suppers, my current favorite gift to busy folks who like to eat well. I originally served it with Red Lentil Dal with light sour cream, naan, and cucumber and tomato slices with Salad Cream. 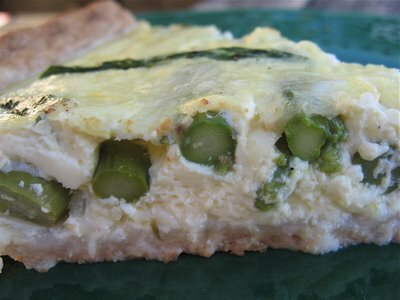 I then paired it as a side with the Asparagus Quiche and a fresh salad -fabulous! Although it has Indian flavors, they're not "hot" spices and you don't need to limit yourself to a pure Indian meal to serve this. Moosewood pairs it with a Cilantro Omelet. And, on a sweet note, congratulations to Nina of Sweet Napa who just graduated from the The Culinary Institute of America at Greystone after completing the 30 week baking and pastry program. I've so enjoyed the vicarious experience! Bring water to a boil and add potatoes. Boil until just tender (about 5 mins). Drain. Heat the oil in a skillet and toast the cumin seeds for a minute. Add the salt and curry powder and stir until well mixed. Take off the heat. Place the potatoes, scallions, and red pepper in a bowl and add the spicy oil. Toss gently then add a couple of shakes of cayenne. Finally, add the cilantro and toss gently. I'm currently not able to connect to email or the Internet. Please stay tuned and I'll be back as soon as I can! 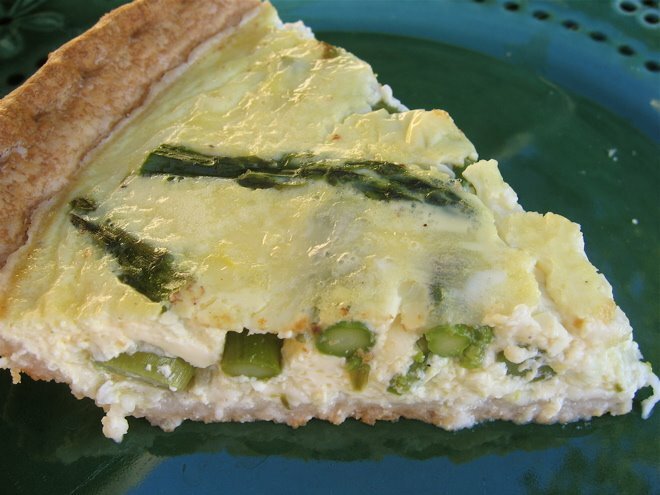 This asparagus quiche came out exactly as I had envisioned it. The asparagus was perfectly cooked, still firm, but with no hint of mushiness. I only used the best part of the asparagus. After snapping off the woody ends where the asparagus naturally breaks, I then cut them into thirds and discarded the bottom third of the stalks (my asparagus were medium thick). I steamed the asparagus , hovering over it and testing frequently until it was just tender. I then rinsed the asparagus with cold water to stop the cooking. I cooked a chopped shallot in a little dab of butter for a couple of minutes. I turned off the heat, moved the pan, and then added the drained asparagus and swished it around until it was well mixed with the shallot. I added a little salt & pepper and a shake of nutmeg. 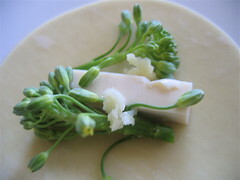 I used about a cup of grated Fontina and placed about 1/2 cup on the bottom of the frozen 9" deep frozen pastry crust. I topped this with the asparagus, saving a couple of attractive tips for decoration. I then add the rest of the grated Fontina and poured in a custard of one egg +one egg yolk and 1 cup of half & half. I arranged the pretty spears on top and baked at 350 for 35-40 minutes. We enjoyed this quiche with an English salad (that is, the salad my Mum makes with lettuce, tomatoes, carrots, scallions, and cucumber) and sliced beetroot, both served with Heinz Salad Cream (an English salad dressing).